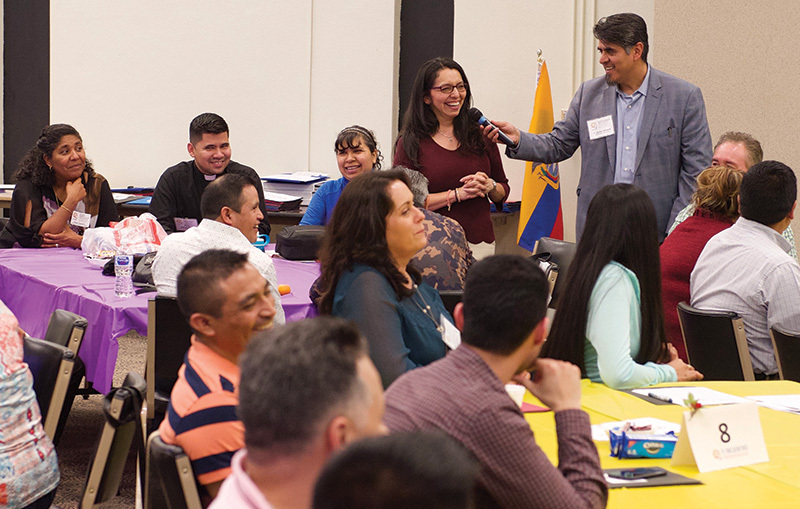 When Hispanic and Latino leaders from a four-state area gathered at Savior Pastoral Center in Kansas City, Kansas, April 27-29, they brought experiences shared with them in countless discussions with their Catholic peers. Those stories were not too different from those of many Catholics. There were stories about ways the church had changed since they were kids. And stories about parish programs that worked — and some that didn’t. Even stories of beloved priests, true leaders of their parish communities. But one story they heard again and again was one unique to the Catholics they were canvassing — and it was a story to break your heart. For it was a story of not feeling welcome. KANSAS CITY, Kan. — The gathering was the historic Region IX meeting held here at Savior Pastoral Center April 27-29, and the final step in the preparation for the fifth (V) national encuentro (“encounter”). In response to the growing numbers of the Hispanic and Latino community in the United States, which will soon constitute nearly half of American Catholics, the U.S. bishops called for the encuentro in an effort to understand and respond to the reality of a changing church. But V Encuentro would be different from earlier ones. For while the stories at the April gathering told an old tale — of exclusion and feelings of alienation — the numbers tell of a changing reality. While earlier encuentros — in 1972, 1977, 1985 and 2000 — approached the pastoral challenge of ministering to Hispanics as a small constituency within the whole, the growth of the Hispanic presence in the last 50 years has given them a new and leading role. Father “Giani” is the director of Hispanic ministry for the archdiocese and has been accompanying lay leaders in the process of preparing for the V Encuentro. This information includes past pastoral plans to current statistics. “According to the statistics that we have gathered,” said Father Giani, “Hispanic people younger than 18 are already over 50 percent of the church in the United States. Preparation for the V Encuentro began in 2015 at the parish level, then continued to develop at the diocesan, and eventually regional, levels. The Region IX meeting was the final meeting of the regional leaders prior to the national V Encuentro Sept. 20-23 in Dallas. Delegates and leaders from 15 Midwestern dioceses across Iowa, Nebraska, Kansas and Missouri attended the Region IX meeting and discussed and analyzed information that has been collected at the parish and diocesan level over the past four years. “We are now able to be aware of what each diocese, each parish, has been doing,” said Milagros Calvetti, the episcopal regional chairperson for Region IX in an address at the meeting. “The church has asked us to know, be grateful for and ask for missionary disciples,” said Calvetti. “This is the principal objective. The information discussed in the regional working document includes the obstacles, needs and situations of Latino people living on the periphery of society; the gifts and talents Latino people desire to bring to the U.S. church; obstacles to integration in the church; and ways in which dioceses can and are already responding. The regional working document also outlined the status of Hispanic ministry available in schools and parishes and the presence of Hispanic priests in the region. Finally, it contained information from the U.S. Census Bureau that highlighted statistics pertaining to income, marital rate, family size, school enrollment and health insurance coverage in both Hispanic and non-Hispanic white households, with the hope that it will help lay and clerical leaders understand the concrete ways in which the church is changing. Carlos Torres, a parishioner of St. Paul Parish in Olathe, was part of the delegation that attended the regional encuentro and has been contributing to the process for years. “I have seen the fruits from the encuentro already,” he said. “At the beginning, people were a little bit shy,” Torres said, when they were asked to get personally involved and lead at the local level. “They weren’t sure that they were capable of going out and knocking on doors,” he continued. But in the end, the mission took hold of them and gave them courage. Another mission required participants to engage a family in conversation about their relationship with the church and society as Hispanics or Latinos. Through the work of the missions, Torres was surprised to find a struggling and wounded church. The mission process revealed that one of these wounds that is a difficulty for Hispanics in this archdiocese and throughout the region is the feeling of not being welcome. “It’s not a question of hanging a sign in front of the church that says everybody is welcome,” said Father Giani. “It’s the attitude. It’s what you do for people to help them feel welcome. Many parishes throughout the archdiocese are already attempting to address these needs — and many more — on the parish level. Just since starting preparations for the encuentro, Torres said, he has noticed constructive changes already taking place. Among several instances, Father Giani praised Good Shepherd Parish in Shawnee and St. Paul Parish in Olathe as examples of parishes who are doing exceptional work of merging the English- and Spanish-speaking communities. In addition, he praised the work that is being done within the clergy. “Monsignor [Michael] Mullen at St. Patrick Parish doesn’t speak Spanish,” said Father Giani, “but he gives the example of an open heart. Near the end of a session at the regional encuentro, Calvetti gave words of encouragement to continue the work of being missionary disciples for Christ. “We must stay alert in the present,” she said, “so we can discover what is here and now in our lives.